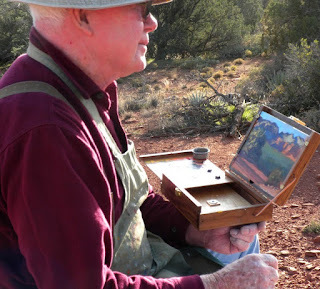 Just got back from the Plein Air Paint-out in Alameda, CA. What really stood out to me was the friendly people in this little community. The town is on on of the many island in the bay of San Fransisco, and is mostly old lovely Victorian homes. Many lovingly keep up with lush gardens and huge old shade trees. 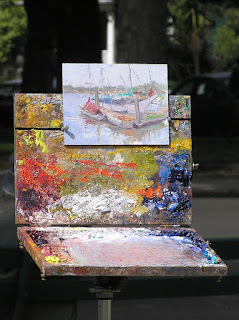 Here is a picture taken by a photographer (Styrous.org) at the Plein Air event last Saturday. The painting is a little 6"x8" piece that I did at Morro Bay a couple of days before. I will get my images ready and post them soon on my website of all the paintings completed at this event. Check out the www.frankbettecenter.org if you have a chance, they were the hosts for the week. Some one suggested that I sell my palette as an abstract, sadly, it would probably sell! I just need a good story to go along with it.